As a football player, Mike Vrabel was frequently characterized as a feisty, hard-nosed linebacker whose toughness and intelligence made him an All-Pro. As the Texans' defensive coordinator, his colorful style hasn't changed. "Animated," Texans middle linebacker Brian Cushing said. "Interesting, but extremely knowledgeable. Very smart. His football IQ is through the roof. He's just a football person. He's a football player and now he's a football coach. He is football, 100 percent, all the time. "He's the kind of coach that's always trying to put his players in the best position possible and it's truly a team defense. Everyone's got to do their job for it to hold up and to be successful, and he does a great job teaching that. We just try to relay it on the field as best as we can." Vrabel was offered the San Francisco 49ers' defensive coordinator job a year ago and was pursued by Washington and the San Diego Chargers before he was promoted from linebackers coach to defensive coordinator. Vrabel is regarded as a tough, passionate coach who relates well to his players. The former New England Patriots standout has a demanding style, but he also communicates well. 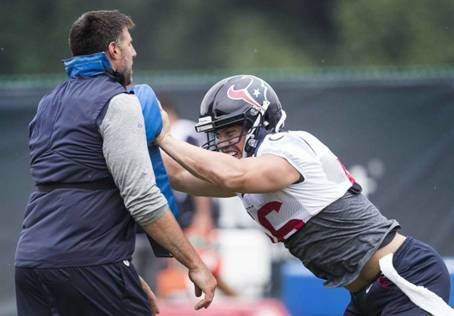 He's been instrumental in the development of Jadeveon Clowney, Whitney Mercilus, John Simon and Benardrick McKinney with Cushing remaining productive under his coaching tenure. "I think he does a lot," Texans coach Bill O'Brien said. "I think he's very knowledgeable, he's a good leader. He's got good command on the field, good command in the meeting room. He's a good coach. "I think you have to have energy as a coach. There's different styles of coaching, but he has a really good style, the way that he coaches."